Push yourself too hard at the gym or spend too many hours hunched over tackling the grout in the bathroom or go window shopping in those stilettos and you are bound to end up with sore muscles. Now, depending on just how much you have worked those muscles, you may have some seriously tender body parts to deal with. Most people take the dangerous way out when dealing with everyday body aches – painkillers! Unfortunately, these pills only offer reprieve for a few hours, but they exact a high cost in return. These NSAIDs are harsh on the liver and the kidneys. So, indiscriminate use of these drugs can have serious health ramifications. How about you resolve to take a more effective and safer option from now on? Yes, we are talking about essential oils blends. They work and they work fast! In fact, with the right mix of oils, you will be up and running in no time. The best part is that unlike pain killers, essential oils preparations not only offer relief from pain but also accelerate the body’s healing process. So, if those sore muscles are a result of your strenuous workout routines, these blends will actually work in conjunction with the nutrients and the exercises to help you build a stronger and leaner physique. Plus, these oils are extremely effective in chasing away the blues and calming a stormy mind. In fact, essential oil blends will take away the pain and leave you feeling fresh and happy. 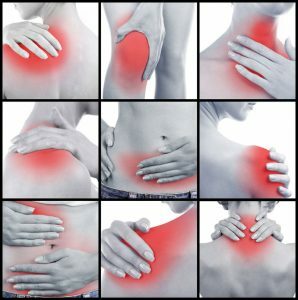 But to understand how these oils help, you will first need to understand the physiology of pain. Why Do You Get All Sore After A Hard Day’s Work? Blame it on the micro tears in the muscle tissue – whether you spent hours slogging at the gym, jogging, hiking or simply running errands. Use a muscle group too much and too hard and the tissue is bound to develop tears. You don’t have to worry too much about these tears because with the right nutrition, your body simply rebuilds the tissue, just stronger this time. But, even for the hardened gym rats, pain can prove to be a deterrent. Why do you feel all that pain? Simple, the tears cause muscle inflammation, which leads to pain. And regardless of how much you get used to your grueling physical regimen, from time to time, you will have to contend with soreness. Hence, you do need to keep an effective remedy on hand that will help you to beat down the pain. 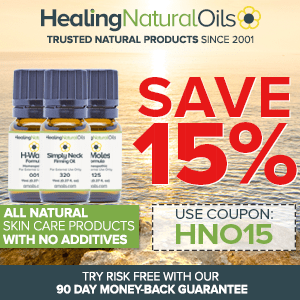 How Do Essential Oils Help With Body Aches? Pain causes both mental and physical distress. Analgesic drugs cover just one aspect of the physical sensation of pain. They do little to curb the mental anguish that the discomfort is bound to cause. In striking contrast, essential oils blends target multiple pain related issues. First, the active compounds in these oils help to bring the pain under control. Next, they go about targeting the root cause of pain – inflammation. In the third step, the oils help to increase blood flow, which means the damaged tissue gets more oxygen and nutrients. Better circulation also equates to faster removal of toxins from the cells. The ready availability of nutrients and rapid purging of toxins leads to faster healing. And last but certainly not the least, these aromatic compounds work on the stress and the emotional center of the brain. So, they help to keep the production of cortisol (the stress hormone) in check, promote relaxation and help you to sleep better. To cut a long story short, with essential oils you get better while you feel better! Do You Need To See A Doctor For Your Sore Muscles? If you cannot trace the pain to exertion or the lack of physical activity, you need to see your physician. Too many hours spent working out and too many hours spent cooped up at the desk can lead to body ache. But, if you don’t have such a reason and particularly if the muscle ache is accompanied by chills, fever, nausea, lack of appetite and visible signs of bruising, you should seek medical attention at once. So, What Are The Best Essential Oils For Sore Muscles? Prized for its exceptional anti-inflammatory properties, this essential oil is often found in Ayurvedic preparations. 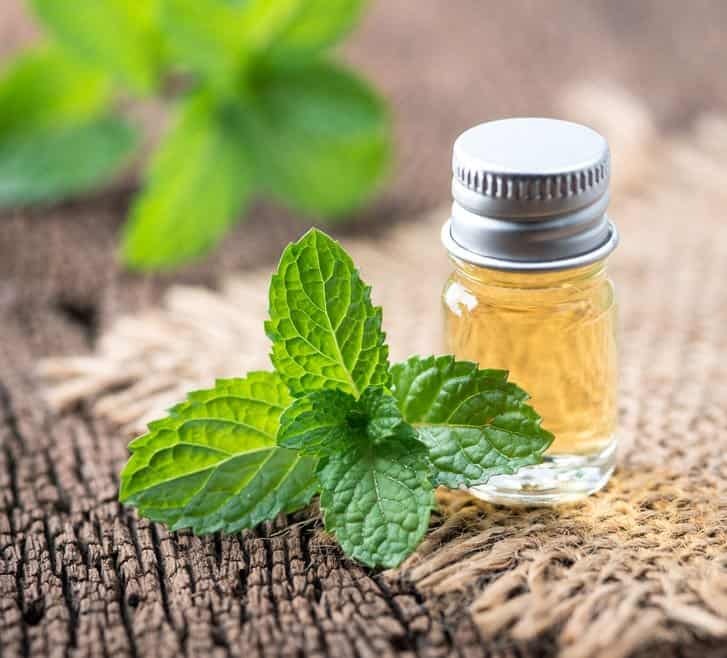 When used in pain relief blends, peppermint essential oil not only reduces the inflammatory response but also alleviates the stress caused by the pain. A natural sedative that is just as potent as the famed valerian root, peppermint oil offers fantastic results even when used against chronic conditions like rheumatism. Another aromatic compound that is coveted in the East, sandalwood essential oil helps to infuse a sense of calmness while it works on controlling the inflammatory response of the body. Although it is not a counterirritant like some of the other essential oils in this list, it is very effective when used in pain management. The antispasmodic oil eases muscle tightness and cramps and sedates the entire nervous system, effectively dealing with both stress and pain in one fell swoop. This pungent smelling essential oil is put to use against a host of ailments and pain happens to be one of them. Particularly, the warm oil can work wonders when used against sore legs, back pain, muscle stiffness and sprains. The oil contains a bioactive compound known as cineole, which has been clinically proven to reduce inflammation and aid in faster wound healing. Extracted from tiny dark blue colored berries, juniper essential oil is often included in blends made to control rheumatism, and with good reason. This oil is a powerful rubefacient, meaning it actually draws blood to the area of application. The added blood supply not only provides more oxygen and nutrients to the damaged tissue, but also helps in clearing the toxin build up. So, if you have swelling or tenderness, juniper oil will help with both. This is another warming oil that works as a counterirritant and targets the pain transmitting nerves. The warmth not only helps to relieve discomfort but also aids in faster muscle recovery. In fact, wintergreen oil is often added to blends that are intended to prevent or limit muscle pain. The antispasmodic, antirheumatic and antiarthritic oil is a rich source of not just phytocompounds but also essential minerals and vitamins. Together, these substances offer nearly immediate relief from muscle pulls, spasms, pain, tightness and cramps. In the Eastern parts of the world, camphor has been used for thousands of years to treat and prevent a whole host of health ailments. In the West though, it has received some bad rep for being too strong. The truth of the matter is that as long it is used topically and in the right dilution, few natural substances are as effective against pain as white camphor essential oil. It not only helps to reduce inflammation but also sedates the nerves in the area of application, thus offering potent analgesic effects. But only use white camphor essential oil in your blends and do not use this oil if you are pregnant, suffer from epilepsy or asthma. This one again is a multipurpose essential oil that offers pain relieving effects that can easily rival those of most OTC NSAIDs. In fact, in one study it was found that the eugenol in thyme essential oil is as potent a pain killer as Ibuprofen (Advil). Even when used topically, this oil yields significant benefits against muscle pain owing to its antispasmodic and tonic capabilities. 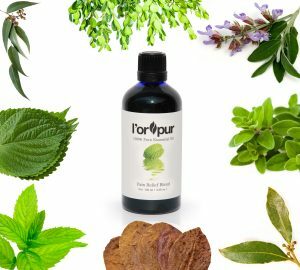 My own pain relief blend, a.k.a L’orpur contains most of the above essential oils together with carrier oils and is blended in the right ratios which allows direct application on the pain-affected areas. It comes in a 100ml bottle (vs similar products which come in at 30ml or less and priced more! ); you’ll also get a spray head for easy application. Click on the above link or image below to read more. Recipe 1: Prevention is better than cure! Grate the kokum butter to a fine powder or melt in a double boiler. Measure 2 tbsp of the resulting oily liquid or 2 heaped tbsp of the powder and add the essential oils to it. Mix well and store in a small glass jar. To use, apply the pain prevention balm on areas of the body that are prone to soreness like the shoulders, lower back, arms, calf muscles and thigh muscles. Rub the balm into the skin for about a minute and then go about your workout session as you normally would. The biggest advantage of using this balm is that it help you to keep going for longer and it stops pain from being a de-motivating factor. Mix the oils together and store the blend in a dark glass bottle. To use, apply on the sore muscle and rub vigorously for a few minutes and then sit back and relax as the oil does its job. This blend works particularly well when used at night. Mix the carrier oils first and then add the essential oils to the blend. Store the mixture in an airtight glass bottle. Apply a few drop to the sore muscle and rub gently for a few minutes. This is a very strong formulation, so do a patch test before using it and don’t forget to wash your hands after application. Pour the alcohol into the bottle and add the essential oils to it. Cap the bottle and give it a shake to mix the aromatic compounds and the alcohol. Spray on sore muscles and let the blend evaporate on its own. Mix the carrier oils and take about 2 tbsp of this blend and heat it for a few seconds. The rest of the carrier blend can be saved in an airtight glass bottle for future use. To the hot oil (should not be burning hot), add the powders and the essential oil. Give the mixture a good stir and apply on the affected part, while it is still warm. Massage gently in circular motion for about a minute or two. Cover the area of application with some gauze or cotton wool and then use a compression wrap to support the affected joint. Leave the compression wrap in place for a couple of hours or through the day/night. Recipe 6: What is pain relief without a warm compress? Grind the mint and coriander leaves and the ginger to a thin paste using your food processor. Fill a large bowl with hot water. You will use this water directly on the affected area, so make sure it is bearably hot. Add the herb paste to the water, followed by the essential oils. Dip a face cloth into the hot water, wring it and apply on the sore muscle/joint. Hold the cloth in place till it cools and then repeat till the water cools. This can be done 3-4 times a day. Recipe 7: A warm, pain relieving bath! Add the salt and the tea to a bathtub full of hot water. Mix the carrier and the essential oils together and add this mixture to the water. Agitate to disperse the oils and allow yourself a leisurely soak in this soothing bath for 20-30 minutes. Voila! You can now follow the above potions or be slightly creative and experiment with some other essential oils that you may have at home or why not try my own pain relief blend l’orpur, which has changed people lives and now it could change yours! 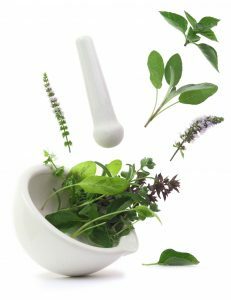 What Are The Best Essential Oils And Recipes For Quick Relief Of Eczema? I’ve got rotator cuff issues in my left shoulder and refuse another surgery (my right shoulder is reverse prosthetic) this does relieve pain and irritation in my left shoulder when I over do it. I had a blood clot in my left leg and I have a lot of pain due to damage to my blood vein and low circulation what would you recommend? You should definitely see a doctor re the blood clot. In the meantime, to assist with circulation, you could use lemon, basil, grapefruit, cypress, ginger, coriander, juniper, black pepper, wintergreen, eucalyptus or Helichrysum essential oils. Dilute 4-5 drops of any of the above essential oils into 1 tsp of almond oil and gently apply to the affected areas, twice a day. For pain, you can always use L’orpur pain relief blend. Hi Olivia , I have had swollen ankles and feet for 37 years when I had toxemia of pregnancy with my first child . I wonder if there is a recipe for “very” swollen ankles in the heat and humidity of summer because it goes away in cool weather ? I have used coconut oil and myrrh essential oil in a 3% strength and it helps but I wonder if you know of any other oils that are especially effective to use on my feet and ankles in summer heat and humidity? You can use a blend of 3-4 drops each of eucalyptus and peppermint and 8 drops lemon essential oil to 1 ounce of coconut oil. That should resolve the issue of swollen ankles. I have a good friend who suffers with something called a ‘Tarlov Cyst’ and just yesterday she slipped and fell while exiting the shower. She is now in severe pain as she had to be hospitalized for a pulled groin muscle. can you offer any advice as to what essential oil blend I can mix and use for her? She now needs help to walk and is in a wheelchair for a short time until she can get back on her feet. Physical therapy is proving to be extremely painful as well. Please help. Peppermint and tea tree oil are the two that I like most. Thank you for this additional list. I will have to try some of the others to see how well they work! Sure, take your time and let me know how you go with them. I would agree and say that peppermint is one of my favorites when it comes to pain relief. I’m an asthmatic and cannot use camphor. What would you recommend I use instead? Thank you! You have a choice of peppermint, wintergreen, juniper instead of camphor. I’ve started hitting the gym on a daily basis but oh my god, I’m exhausted and super sore, I can barely get up in the morning. Don’t get me wrong, I love the results, but it’s much more tiresome than I’ve expected. I think I’ll try the eucalyptus, sandalwood and camphor oil blend, I need a super quick relief, I can’t go on like this anymore. One question though, how often should I use it? I’m guessing the eucalyptus oil is pretty strong, right? Sure, sometimes you have to go through some pain to achieve results, keep it up. You can use the above-mentioned blend up to three times a day, I’d suggest twice, morning and prior to bedtime. Indeed, eucalyptus is an analgesic, i.e. great for pain relief. The article and recipes – absolute masterpiece. I tried Recipe 7, replaced sandalwood (very very expensive oil) with marjoram and I was simply in heaven – pain gone, but wait it gets better. Only issue is my wife got me to clean the tea leaves in the bathtub – I did my back again. So, I will need to order your l’orpur. Whether she likes it or not, she will have to rub me now!!! I am without words, well I like your sense of humor…but I am so sorry with what happened to you. Take care. Let me know how you go with l’orpur.